Taking time to strengthen relationships over a cup of tea can be good for emotional and physical health. The tea warms your body and adds health-promoting substances to the diet. The time spent in conversation with a friend or family member can strengthen those important social bonds that enhance health and well-being. A warm-weather evergreen, Camellia sinensis is the source of tea leaves for all varieties of regular tea. The degree of processing or oxidation of fresh tea leaves determines the type of tea produced. Green tea has minimal processing. The leaves are steamed, rolled and quickly dried prior to packaging. Thus, green tea is not oxidized and is characterized by its delicate taste and light green color. Widely enjoyed by people in the Orient, it is becoming more popular worldwide. Black tea is produced by allowing the tea leaves to be fully oxidized or fermented (about 60 to 90 minutes). Black tea is characterized by its hearty flavor and deep amber color. Popular black teas are Earl Grey, English Breakfast, Darjeeling and Orange Pekoe. Oolong (red) tea is produced by allowing a shorter time for the processing or oxidation to occur (about 30 minutes), compared with black tea. Thus, the color and taste of oolong tea can be considered midway between green and black tea. Oolong (red) tea is popular in the Orient. White tea is produced in China and utilizes young tea leaves and unopened buds. It produces a delicate brew with a soft, velvety flavor with little caffeine. Herbal tea is produced from various native herbs or plants, utilizing the leaves, stems or roots, depending upon the intended use. Native cultures around the world have used herbal teas for medicinal purposes. Tea is the primary beverage of many cultures. Tea appears to have originated in China, with exports for at least 1,000 years. Other Asian countries also have a long history related to tea production and use. The Japanese tea ceremony is a traditional ritual, influenced by Zen Buddhism, in which a highly trained tea practitioner serves green tea to a small group of guests. In the 1600s, an English trade company was established and began to bring goods, including tea, from the Orient to England. England began to use tea, and soon it became the primary beverage. Afternoon or low tea was established as an elegant snack served in the late afternoon around 3 or 4 p.m., with small cakes, assorted sweets, small bread-and-butter sandwiches and tea. Initially, the upper classes primarily served low tea. The English served high tea later in the afternoon or early evening. It was the main meal of the day for the middle and lower classes. In the early 1700s, tea became a staple of trade between the English colonies in America and England. Tea was among the goods and services England taxed to help pay for the French and Indian War. The tax on tea eventually led to the Boston Tea Party and opened the colonies’ armed rebellion against England. Researchers have found an association between those who drink tea, especially green tea, and a reduced risk of certain chronic diseases, such as cancer, heart disease, stroke and diabetes. The substances in tea associated with these health benefits are called polyphenols, mainly flavonoids. Studies suggest catechins, a type of flavonoid, are the component primarily responsible for the health benefits of tea. All three types of tea (green, black, oolong) contain catechins, but green tea has about three times more catechins than black or oolong tea. 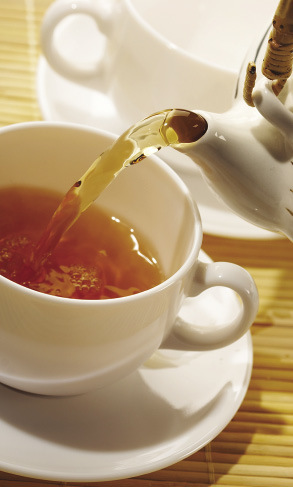 Population studies indicate tea may help reduce the risk for heart and blood vessel disease. Tea’s potential role in reducing risk may include the following: (1) help improve blood vessel function, (2) help reduce blood clotting and/or (3) help reduce the level of oxidized cholesterol known to promote heart disease processes. Studies of the role of tea in cancer prevention in human populations have not been conclusive. However, laboratory research suggests that tea may play a role in reducing cancer risk in various ways: (1) reducing the initial development of cancerous cells, (2) reducing the growth of cancerous cells and/or (3) promoting the early death of cancerous cells. Researchers believe the caffeine in tea is the component that lowers the risk of Type 2 diabetes. Caffeine appears to enhance glucose metabolism and thus assist in control of blood sugar. Therefore, drinking suggested amounts of tea or coffee may help reduce the risk of Type 2 diabetes or help improve management. Health experts have suggested variable amounts of tea from 2 to 10 cups per day to promote health, but no definitive recommendation is available. However, even small amounts of tea contribute polyphenols (antioxidants), which have been found to enhance health. Note: Those having iron-deficiency anemia may need to limit the amount of tea they drink because chemicals in tea are known to bind iron and decrease its absorption. Bring freshly drawn water (preferably not softened or hard) to a boil in a glass or enamel container (not aluminum), remove from the heat and cool for one to three minutes. In a teapot made of glass, china or porcelain, place about 1 teaspoon of tea leaves for every 6 ounces of water. Allow the tea leaves to move freely in the water (referred to as “blossom”) and then strain when poured. If using an infusion basket or tea ball, select one large enough to allow the leaves to move. The length of brewing time can affect flavor. Usually steep for three to five minutes. Experiment with the amount of brewing time to get the desired flavor, or follow the manufacturer’s directions. When time allows, warm the tea cup before serving the tea.